I wish I had another gear. 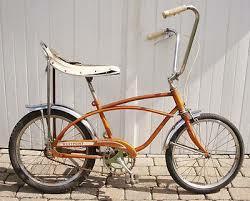 I yearned to keep up but couldn’t. Now imagine you’re an adult who struggles to read. You don’t have the gears to keep up. For whatever reason you never learned basic reading skills and life circumstances beyond your control prevented you from progressing. An alarming truth in the United States is that many Americans have deficient reading skills. ProLiteracy, a non-profit organization based in Syracuse New York, reports that 36 million adults in the United States cannot read, write, or do basic math. That’s more than eleven percent of our population. Nationally, sixty-eight percent of literacy programs struggle with long student-waiting lists, and less than ten percent of adults in need actually receive literary support services. In the Central Intelligence Agency’s [yes, the CIA] World Factbook, the CIA reports that the world literacy rate for individuals age 15 and over is 86.2%. According to the CIA, Greenland, Finland, and North Korea’s literacy levels outrank the USA with a hundred percent literacy rate of their respective populations. Granted, these three countries have a combined population of only 30 million. Another news source, the Washington Post, reports that the USA literacy rate ranks in the world’s top 7 behind Finland, Norway, Iceland, Denmark, Sweden and Switzerland. More people live in California than those countries’ population combined. Maybe, because these countries are geographically smaller and more homogenous, it’s easier to reach people. Beats me. Americans obsess on being “Number 1,” whether it’s gross domestic product, economic growth, or Olympic medals. What should we think? Shouldn’t we strive the highest rank in literacy? Those issues can be debated by experts but the folks at Butte County Library Literacy Services have taken action. In 2012 Catholic Charities of Calfornia reported that over 25,000 adult in Butte County struggled with their reading and writing skills. For the past 11 years the Butte County Library has been developing, growing, and sustaining literacy programs that serve a county-wide clientele including adults and young kids. From sponsoring the County Book Mobile Literacy Coach, which travels throughout Butte County, to coordinating volunteers who tutor adult learners, your local library Literacy Services answers the call to promote literacy. Consider these testimonies of two adult learners who advocate Butte County Library, Literacy Services. Greg, an equipment operator, and Amanda, a college student and mom, overcame long odds to break the chains of fixed mindsets, that they were destined to stay behind. Indecision is a decision. Both Greg and Amanda had the courage to make a decision and reach out for help and to receive it. They’ve since hit another gear. 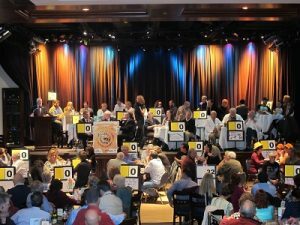 Come to November’s Trivia Bee and see how lives have been changed. The event is a total blast. Set up a team or just come watch. 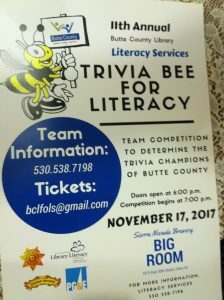 The 11th Annual Butte County Trivia Bee will be held in Sierra Nevada Brewery’s Big Room, Friday night November 17th. Doors open at 6 PM. We anticipate a sell-out. I’ll be there with friends, helping to emcee the party. We’ll have some laughs, celebrate, and share good cheer. Please choose to support Adult Literacy programs. It’s not only an investment in the lives of particular individuals but rather an investment in our society. For more details click here or call (530) 538-7198. PS Literacy Services and their volunteer tutors rock! If you enjoy these type of posts visit my Etc. Guy Facebook page and LIKE it. Thanks. This entry was posted in Community, Words of wisdom and tagged adult literacy, american literacy rates, butte county library, butte county library literacy services, reading services, sierra nevada big room. Bookmark the permalink. A great plug for an outstanding event. 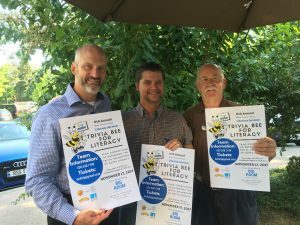 I’ve helped with and supported the Trivia Bee for 10 years and enjoy the fun and entertainment that supports a host of important library literacy programs. Attend and you will be happy that you did.